Dividing the space is another design ruse often employed to make a small area appear larger. The division may be in the form of e.g. a latticework screen, or a line of trees, shrubs or tall potted plants. Through the dividing screen, the rest of the garden can be glimpsed giving the illusion of more area. Using small-leafed plants (but not necessarily small plants) in a small area gives a greater feeling of spaciousness than using plants with large leaves. Acer palmatum (Japanese Maple), Pittosporum ‘James Stirling’, Buxus sempervirens (Box), Viola labradorica (Labrador Violet), and Cymbalaria muralis (Kennilworth Ivy) are all useful plants. 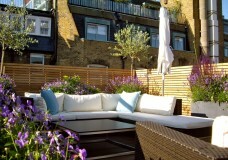 The colours that are chosen are important in small gardens. Avoid a confusion of bright colours which look crowded and busy. Soft blues and lavenders suggest distance while hot colours like reds, yellows and oranges bring things closer. 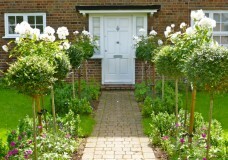 Where space is at a premium, gardeners should consider combining plants with differing phenology e.g. combining spring flowering and autumn flowering bulbs so that one lot is dormant while the other lot is flowering and allowing winter-flowering creepers to climb through the branches of deciduous shrubs to provide winter colour. By purchasing standards or removing lower limbs from trees and shrubs, the area below may be used for additional planting. Too much variety creates a feeling of clutter. 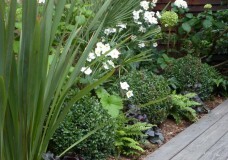 A simple planting scheme of a few species often works best in a confined area.